After returning to the Hill Country, Maryneil devoted her time to capture the scenic beauty of the land and the mystic elegance of its animals in her current chosen medium of pastel. She is also adept in watercolor, oil, and handmade paper collage. Her influencers, which are evident in the emotional landscapes she creates, include Albert Handell, Dawn Emerson, Hill Country artist”s Denise Mahlke, Gordon Fowler and western and Equine painter John Fawcett. However, Maryneil credits her late Aunt Sissy as being her primary influence. 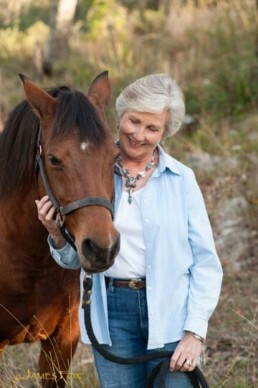 She was an equestrian and animal handler, showing horses and dogs professionally all her life. “Recently I have been experimenting with watercolor backgrounds and incorporating them into my subject. It is a fascinating practice, and I love the results.” Maryneil goes on to say. Maryneil and her husband Tom live and paint on their ranch in Fredericksburg, Texas. Maryneil Dance is a fourth generation daughter of the Texas Hill Country, for which she developed a deep connection seen throughout her art. Art Past Dark : BEST OF SHOW!